I went to Clancy’s, a local SF shop that sells great sandwiches and loads of fun groceries like hard-to-find sodas (remember New York Seltzer?) and candy. They always have a slew of Europe-only Haribo. I bought 2 packages – unsure if we had reviewed either. The one we had reviewed was Sali-kritz, which are like really big Good n Plenty, only a tad fruitier. They are awesome. 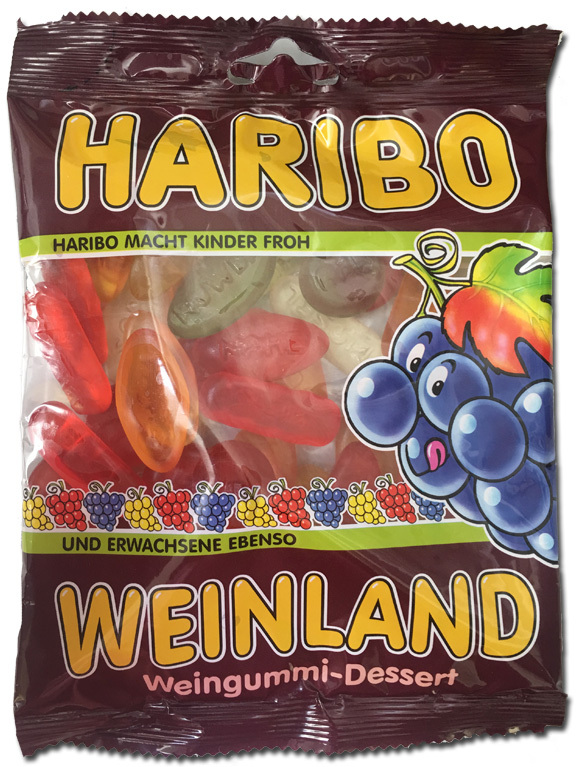 The ones we hadn’t reviewed are these, the Haribo Weinland. Which are especially un-awesome. Bummer. Wine gums are notorious favorites of the Gurus. They don’t actually taste like wine. It is believed they were initially created in the late 1800’s by a guy in a very alcohol-free kitchen, so there is no such sin in the candies. 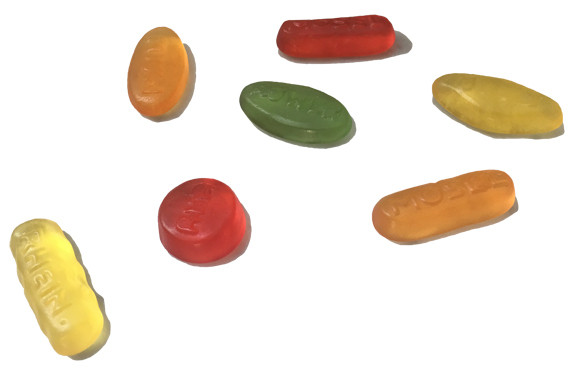 They were most likely called “wine” gums to drum up interest, or perhaps the relatively stronger flavors – compared to other candies of the time – were meant to be savored like a fine fermented grape beverage. There are some great wine gums out there, (try Maynard’s if you haven’t yet) and since Haribo makes some of the best gummies in the world, it’s hard to believe their wine gums wouldn’t also be worthy of a great review. Simply put, the Haribo Weinland gummies are pedestrian. With flavors like lemon and cherry and orange, and shapes like you see below, these gummies are just not that great. Sure they have that great Haribo chew, and the floral-but-not-too-over the top flavor is throughout. But that’s it. They’re boring. And boring is a terrible adjective for anything, especially candy. Leave these on the shelf and go for the loads of other Haribo that are wonderful.